The weeks before Christmas speed by, and we’ve already reached the second Sunday in Advent. On Monday the long-awaited Research Bill was presented. Having heard others’ reactions, it’s fair to say we’re not the only ones to give the bill a lukewarm reception. For our own comments, see the last blog post. The Vice-Chancellor spent all day Wednesday at a conference on the theme of ‘Equal education’ arranged by the Institute of Education Law at the Faculty of Law. 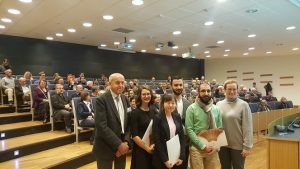 The purpose of the Institute is to inspire and support research and education in the area of education law in Sweden, in the broadest possible way. Setting out from the broad academic environment offered by the University, the Institute’s brief is to promote the study and analysis of jurisprudential and related issues surrounding education at all levels, in a manner that is beneficial for Sweden. Read more about the Institute here. The conference on ‘Equal education’ certainly succeeded in this. Thank you for an inspiring day! On Thursday Friends of Uppsala University had invited PhD alumni in and around Uppsala to an evening event. For many of them, the event was a fond reunion with their Alma Mater. We intend to step up our alumni activities and fundraising in the coming years. The Friends presented merit scholarships to six very deserving students now concluding their Master programmes. On Friday we signed an agreement of intent on enhanced collaboration with RISE Research Institutes of Sweden. The aim is to strengthen Swedish competitiveness and growth through increased collaboration between universities and industrial research institutes. Read about the agreement here. In the coming week we would like to recommend ‘Åsikt Uppsala’ (‘Uppsala Opinion’) on Wednesday 7 December. The University and local newspaper UNT are holding an open panel discussion on newly arrived immigrants and the labour market. For the many people who have recently come to Sweden to create a new life for themselves, getting a job is key – both for their own self-esteem and for integration. The discussion will be held at Missionskyrkan, starting at 19:00. 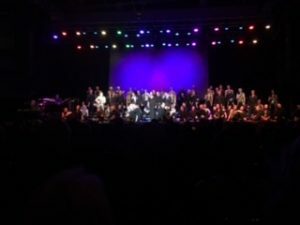 And then this weekend it was time for OD’s annual Caprice concert at the IFU arena. We’d like to thank OD and their guests for a successful concert and look forward to next year’s Caprice in the newly renovated University Main Building.